It's 12 October 1984. An IRA bomb blows apart the Grand Hotel in Brighton. Miraculously, Margaret Thatcher survives. In small-town Scotland, eight-year-old Damian Barr watches in horror as his mum rips her wedding ring off and packs their bags. He knows he, too, must survive. Damian, his sister and his Catholic mum move in with her sinister new boyfriend while his Protestant dad shacks up with the glamorous Mary the Canary. Divided by sectarian suspicion, the community is held together by the sprawling Ravenscraig Steelworks. But darkness threatens as Maggie takes hold: she snatches school milk, smashes the unions and makes greed good. Following Maggie's advice, Damian works hard and plans his escape. He discovers that stories can save your life and - in spite of violence, strikes, AIDS and Clause 28 - manages to fall in love dancing to Madonna in Glasgow's only gay club. 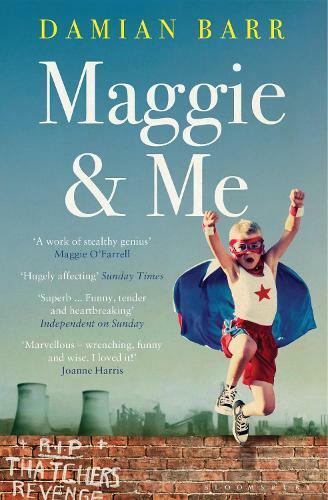 Maggie & Me is a touching and darkly witty memoir about surviving Thatcher's Britain; a story of growing up gay in a straight world and coming out the other side in spite of, and maybe because of, the iron lady.